Public testing and demonstrations of the ARCHR system in the Johnson Center at George Mason University. Testing will be on Friday, November 14th from 12:00 to 15:00. 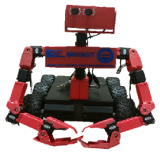 MiniBot, Baxter, and OpenHubo will be used for the live testing and demonstrations. Live demonstrations of the ARCHR system to local middle school students in the Lofaro Labs (Room 4605) at George Mason University. Testing will be on Thursday, November 13th from 10:00 to 11:00. MiniBot, Baxter, and OpenHubo will be used for the live demonstrations. Please come see Dr. Hae Won Park from the Georgia Institute of Technology give her talk "Robot Learners: Interactive Instance-based Learning with Social Robots." The date, time, and location are listed below. The abstract and bio are attached.